The classic introductory adventure for DCC RPG returns in this limited edition set of customized covers. The original cover art by Dough Kovacs is well known to DCC RPG fans. In this limited printing, a selection of old-school illustrators were asked to interpret Doug Kovacs' original sketch. Their inked versions of that original sketch are printed as alternative versions of the DCC #67 cover. In addition, Dough produced a new gold-foil cover design. This envelope contains one customized version of DCC #67, featuring either Doug's original sketch, the new gold foil design, or the inked version by another artist. Contributing artists include Peter Mullen, Brad McDevitt, Stefan Poag, Russ Nicholson, Chuck Whelon, Michael Wilson, William McAusland, and Diesel Laforce. Since time immemorial, you and your people have toiled in the shadow of the cyclopean ruins. Of mysterious origins and the source of many a superstition, they have always been considered a secret best left unknown by the folk of your hamlet. 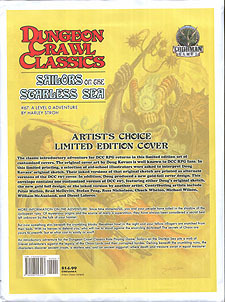 An introductory adventure for the Dungeon Crawl Classics Role Playing Game, Sailors on the Starless Sea pits a mob of 0-level adventures against the legacy of the Chaos Lords and their corrupted hordes. Delving beneath the crumbling ruins, the characters discover ancient crypts, a starless sea, and an ancient ziggurat, where death and treasurer await in equal measure!